(Nanowerk News) Fifty years after it was originally discovered, scientists at the Friedrich Miescher Institute for Biomedical Research have elucidated the function of a microscopic network of tubules found in neurons. This structure modulates the strength of connections between two neurons, thereby contributing to our ability to learn and to adapt to new situations. In the current online issue of the Proceedings of the National Academy of Sciences ("Differential distribution of endoplasmic reticulum controls metabotropic signaling and plasticity at hippocampal synapses"), Oertner’s group describes how the microscopic network of tubules known as the endoplasmic reticulum (ER) modulates the strength of connections between neurons. Neural connections play an important role in our ability to learn new information and constantly adapt to new conditions. In the brain, synaptic connections between neurons are thus continually formed, strengthened or weakened. In addition, there are connections that remain stable – for example, when we store an important memory for many years. Connections of both types coexist, and their close proximity was one of the first key findings of Thomas Oertner’s study: the two types occur side by side on the same neuron and are individually controlled. 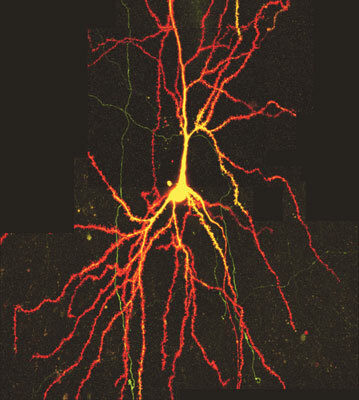 Niklaus Holbro, a PhD student in Oertner’s group and co-author of the study, also shows that – surprisingly – the presence of ER in the dendritic spines of neurons accounts for the difference between stable and variable synaptic connections. If ER is present, the connections between cells can weaken. When the neuron is stimulated, large amounts of calcium are released from the ER in the spines, triggering functional changes in the synapses. The FMI neurobiologists have thus been able to ascribe an important function to this hitherto mysterious structure 50 years after it was first described by Edward George Gray in 1959. Observations and comparisons of individual dendritic spines and synapses are anything but routine. The findings just published were only possible thanks to a new method known as two-photon microscopy. In this imaging technique, a pulsed infrared laser is used to excite fluorescence in a dye molecule in a cell. It is a gentle method of investigating cells, which yields unique, high-resolution images. Thomas Oertner’s research group is one of only a few worldwide that use this technique to optically stimulate and observe individual synapses, and to measure their activity. As equipment of this type cannot simply be purchased off the shelf, these innovative microscopes are custom-built and refined by Thomas Oertner himself. The Friedrich Miescher Institute for Biomedical Research (FMI), based in Basel, Switzerland, is a world-class center for basic research in life sciences. It was founded in 1970 as a joint effort of two Basel-based pharmaceutical companies and is now part of the Novartis Research Foundation. The FMI is devoted to the pursuit of fundamental biomedical research. Areas of expertise are neurobiology, growth control, which includes signaling pathways, and the epigenetics of stem cell development and cell differentiation. The institute counts 320 collaborators. The FMI also offers training in biomedical research to PhD students and postdoctoral fellows from around the world. In addition the FMI is affiliated with the University of Basel. The Director of the FMI since 2004 is Prof. Susan Gasser.